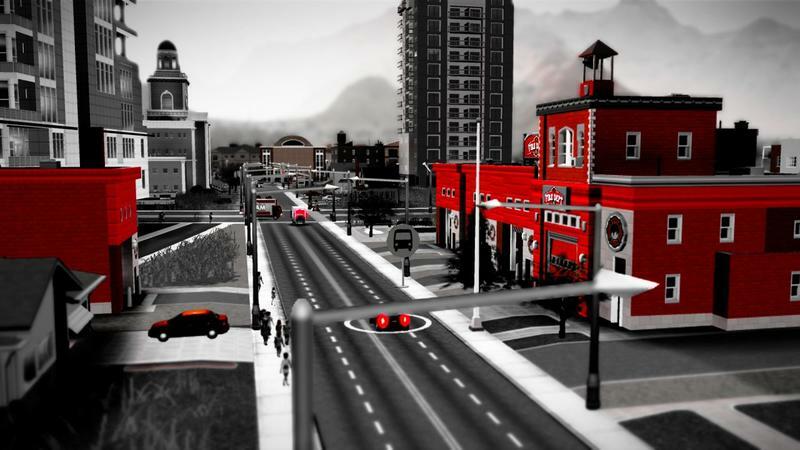 Maxis and EA have rebooted a classic and epic city management game with their brand new effort. Simply called SimCity, this title is a collection of old gaming principles and new gaming ideas. Some of it works really well, some of it feels like a mistake and other parts of it don't work at all. We're moving past the server issues that met EA and Maxis at the launch gate, and we've finally seen a version of the game that, for the most part, is playable. This is the new SimCity. Hopefully you haven't already flashed ahead to see how we scored the game. If you did, well, that's fine. There's no going back now, right? 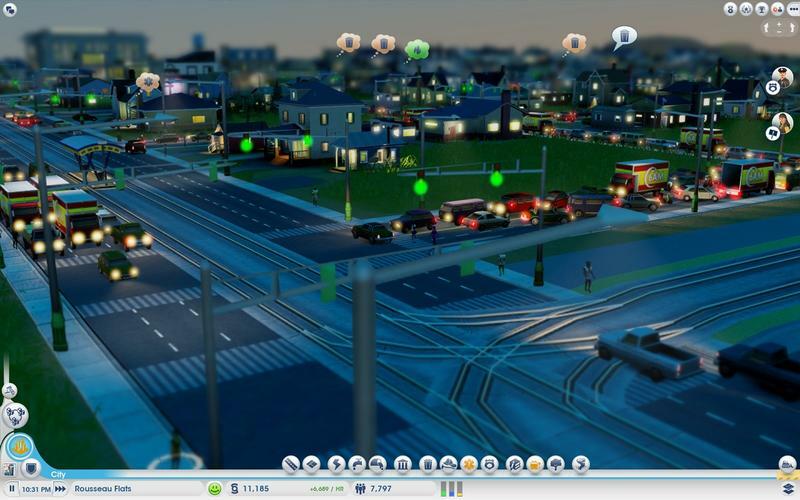 This review presented a set of challenges that came together to make rating SimCity uniquely difficult. 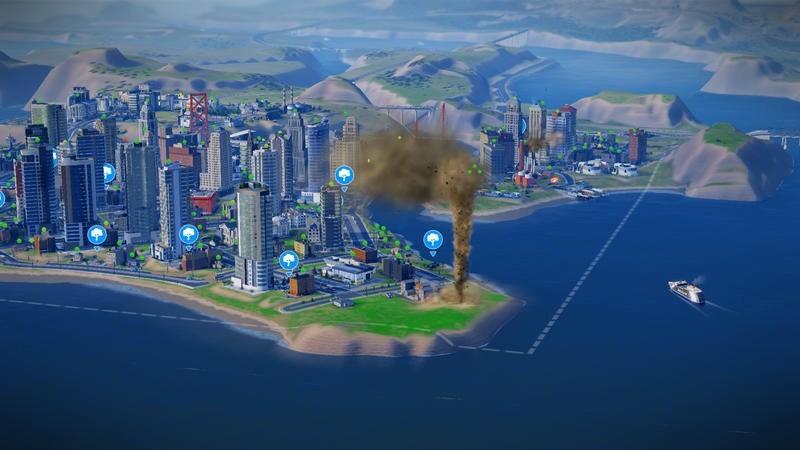 We've covered it extensively before (and you can read that coverage here), but the basic gist is that SimCity's online design made it completely unplayable during its launch. Too many players brought EA's servers to a grinding halt, and gamers who wanted to play had to sit through exceptionally long virtual queues and try to access the game at odd hours. 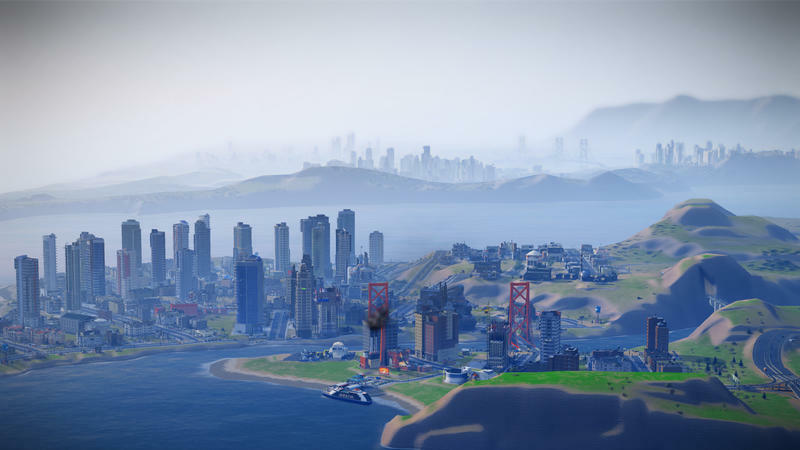 Over the week since SimCity released, EA and Maxis have continued to add better servers to accommodate for the increasing demand. 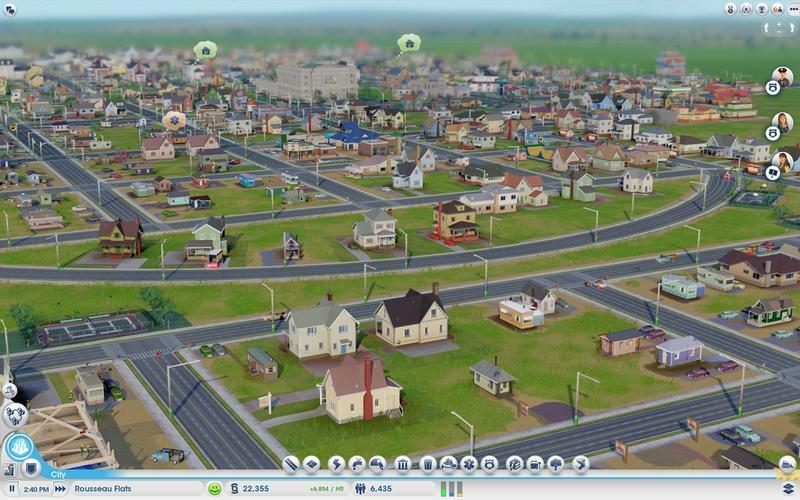 As of SimCity's opening weekend, the game is much more playable. It's not perfect, but it's entirely possible to launch the software and get to playing straight away. And that status will only improve moving forward. I personally wrestled with how we should handle our SimCity review. The written bit wouldn't be a problem, because I knew that it would be easy to essentially list the ups and downs of the game while exploring the flawed nature of its online dependance. The score, however, was the big challenge. You can hear a little of my verbal debate between TechnoBuffalo EIC Sean Aune and me on our recent Tech on the Range episode. Are we to score SimCity's launch, or are we to score SimCity as a product? If this were launch day, and our review was only to represent the status of SimCity at the exact moment it was written, the game would likely earn a 2 out of 10. It was unplayable. When it worked, it was laggy and full of server-spawned errors. However, this review isn't being published on launch day. It's been roughly a week since the game's release. We're scoring SimCity as a working product. We're not scoring SimCity's launch. If we were, EA and Maxis would get abysmal marks. But, we aren't. Furthermore, we elected to review SimCity in the same manner that we covered its first closed beta. This review has been built on the back of a conversation between Eric Frederiksen, one of our gaming writers, and me. Joey Davidson: SimCity's been out for almost a week (as of this exact moment), and I've logged more than 20 hours in city construction and management. On the whole, I've enjoyed my time. The game doesn't arrive without issue, but I feel like there's still a lot of SimCity left to experience. How long have you been behind the mayor's desk so far? Eric Frederiksen: I've spent about 16 hours building and bulldozing thus far, and I'm looking forward to jumping back as soon as I can. Joey: I have to say that one thing I keep considering when it comes to my time spent in SimCity is that I never quite feel like I'm making the right decisions. Players are super tight on space with this entry in the series, and that leads to making a lot of choices. I dump around four hours into a city, and I start to regret being creative with curved roads and layout selection. It's like my choices catch up with me very quickly, and I either reap the benefits of a well placed city block, or I start to regret relying on wind and sun to power my town. Eric: The big themes, if a SimCity game can have themes, are choice and risk. I'd call this game the biggest change since the switch from 2D to Isometric way back in SimCity 2000. Instead of trying to have it all, you have to think about what you want to do with your city and plan for it. You have all these options available, and not nearly enough room for all of them. Further, by the time you have the money and population to make some of these choices, you've long-since filled up your city. Becoming a culture-based city, for example, is a huge risk. Those curved roads are fun to experiment with, but when you try to move past those first couple hours, the game starts punishing you for making anything but a grid which is, simultaneously, one of the more disappointing callbacks to older SimCity games and a real indictment of the map size. Joey: Stick with me here as I dive in and interrupt you, but isn't the whole point of management games like this one "having it all?" Heck, the whole EA marketing campaign behind this game was that it gave players the ability to build whatever kind of city they want to. And yet, the game punishes those who try for diversity. You want to build a green city with a good tourism base? Good luck doing both, as the space simply isn't there to support solar and wind energy, an elementary school, a high school, a college and the right departments to get up to nuclear power. Oh, and you'll need enough space for the tourist attractions and a good enough mass transit system to get people in and out of your city. I hate to hit on this too hard, but the size limitations feel like the root of all evil with this game. It'd be much better if I just had a little more space. Eric: Bringing up all those placeable services – schools, utilities, etc. – brings another problem with the map size to mind. You're given all these buildings you can expand on, and no matter where you put them they end up feeling like a burden. I put down a building and feel like I can't do any of the fun stuff with it, except put down a flag. Joey: Right, and maybe a sign. Eric, you've been saying that you like the fact that this game forces tough choices on players. How do you counter my argument that forcing tough choices constantly isn't necessarily a good thing? …the size limitations feel like the root of all evil with this game. It'd be much better if I just had a little more space. Eric: That's a good question, and a tough one. During the run-up to release, I followed the game fairly closely, and I think when I saw the prevalence of specializations and learned about the limited map size, I was able to go in knowing I'd have to make those choices. It's a great idea that works well enough to make the game fun, but I'm a little concerned about how it'll last without some serious work from Maxis to improve what's already there and add on additional features. 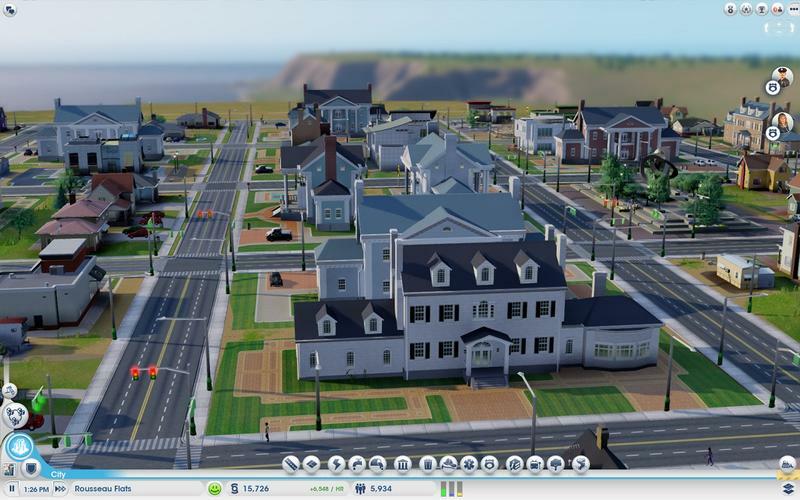 Joey: Is too much diversity a bad thing due to the size limits of this SimCity? Eric: I think that it's a different kind of diverse than we're used to, and that's going to rub some people the wrong way. I think cities are going to be different from one another more than ever before, but the cities themselves are going to be more focused. Does that make sense? You're working to make a well-oiled machine instead of a jack-of-all-trades. Joey: So then we find ourselves on opposite ends of the player spectrum. You like being pushed towards tough decisions, while I prefer a more open ended experience. On that note, I thought I'd love the ability to build curved roads a lot more than I actually do. I hate to say it, but it comes down to size again. Curved roads lead to a less dense city. That would be fine if the borders allowed for more suburban sprawl; but, they don't. You need density to "win." I feel like I know how you'll disagree with me here, but I'm asking you anyways. Am I crazy for not liking curved roads? Eric: Now, do you not like them aesthetically, or do you not like them as implemented in the game? Joey: Oh, I love how they look. In fact, laying curved roads down is far more satisfying than it should be. Matching visual grids and getting a nice arch in your city is amazing. I hate how ineffective they are, though. Eric: I think they're a great idea, but the space limitations make them mostly worthless. They're a huge pain except in specific circumstances that go with the lack of terraforming we saw in the other games. Eric: One of the biggest problems are all the teensy, tiny little bugs populating the game. There's a thread going on the SimCity forums with 52 bugs right now. Water tables don't replenish, citizens protest crime in cities with one crime/arrest per day, garbage trucks sent to neighboring cities just never come back. The game's choices and interactions depend on the underlying systems working better than they currently do. They work well enough for the game to be fun, but not well enough for it to last as it is. Joey: The bugs are never that obvious, either. I had a city filled with protesters standing up against excess garbage. It took several dumps, upgrades and a lot of spent virtual money before I realized the protesters were just, well, wrong. Eric: Exactly. They're insidious, and they don't show up until your city's more vertical than horizontal. The risks multiply making the hard choices harder, and the bugs make you second guess every choice. Bug workarounds often involve turning off sharing of that particular utility, going dead opposite to the whole idea of the game. 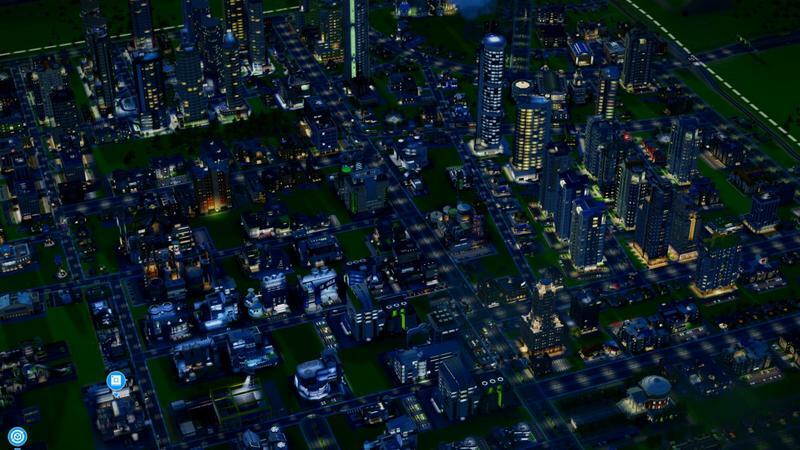 What Works Well in SimCity, Then? Eric: That's a good question. It sounds like we really hate this game, doesn't it? My sixteen hours certainly wasn't painful, as I hinted at earlier. I like tweaking things. I made a couple adjustments to a block and had six skyscrapers going up at once. It was awesome. The art design in SimCity is gorgeous. Even when I've seen everything, I still don't get tired of looking at it. Those tweaks matter because they can change a whole city block at once. It's fun to watch your city evolve as you make minor changes. Joey: Absolutely, and I especially love the tilt-shift aesthetic they applied to the perspective. It makes the world look like a model. Coupled with the perfectly balanced music, man, this thing sings. I also especially love how smooth and gratifying things are when they work. The click of power coming on, the pumping of water and the plopping of a big building. It's all been designed and orchestrated with an emphasis on style, and it makes the game extra addictive. Eric: The aesthetics of SimCity are so good that they push the problems into the background for longer than they really should've stayed there. As an aside, SimCity has given me the chance to say lots of fun things. I was talking with a friend about plopping dumps, and saying Ocean Quigley (the game's Creative Director) never gets old. Joey: Though, that makes it seem like this is a game of misdirection. Don't worry about the actual quality of the game, just enjoy the little things for as long as possible. I really don't think you believe that's the case, Eric. Eric: No, I don't. A lot of the mechanics work for the first few hours. The game allows you to build a fun, unique city that evolves in a way that feels very organic. As you advance, though, things get more and more twitchy. It starts to get frustrating instead of fun when you get deeper in. The server trouble we've been talking around might be exactly why I've had so much fun with it; it was hard to get really deep into the game and knock it around. Now that we're there, some of the cracks are starting to show and they're going to, as I mentioned, have a severe impact on the game's longevity if they don't fix them quickly. Joey: I completely agree with that sentiment. At 20 hours played, I'm almost ready to move away from SimCity. That's the first time I've ever said this with Maxis' city management series. 20 hours used to be a drop in the bucket, but I feel so handcuffed by the way this game was designed. The bugs, the size limits and, we're finally getting to it, the forced reliance on other gamers are all piling up to drive me away from this game. Though, I know you have a different stance when it comes to the whole multiplayer angle of this game, so I'll let you step up to the plate first. Tell me about Region Play and why you like it. Eric: I think the ideas behind SimCity are great. The implementation works in a pretty basic way. I completely subscribe to Maxis' idea that cities should not exist in a bubble. It's social in a way that, to me, doesn't feel forced. Not every city has a stadium, not every city has a processor factory. This, to me, is where SimCity feels like it was headed. To not do this would've felt like just a face-lifted rehash. Checking out my friends' cities, seeing them in the background as I play through the game's night cycle, and I'm looking forward to participating in a Great Work if we can ever wade through the bugs to get there. Joey: What about the idea that you almost have to rely on your friends' cities in order to be successful? Eric: That's the whole point of the game. It's the new wrinkle to city simulation, as envisioned by Maxis. When it works, it's really cool. It's cool to spot one of my ferries departing for a city halfway across the region. Even the infographic arrows that depict what's traveling where are awesome to see. But, once again, it breaks too often. I like region play, and I think it adds a lot to SimCity, but you've mentioned at least once that it just isn't working for you. Tell me what doesn't work for you about the social side of SimCity. Joey: Sure. I'm personally a fan of of the solo nature of classic SimCity games. Over the span of the series, I dumped hundreds of hours into building various dream cities. 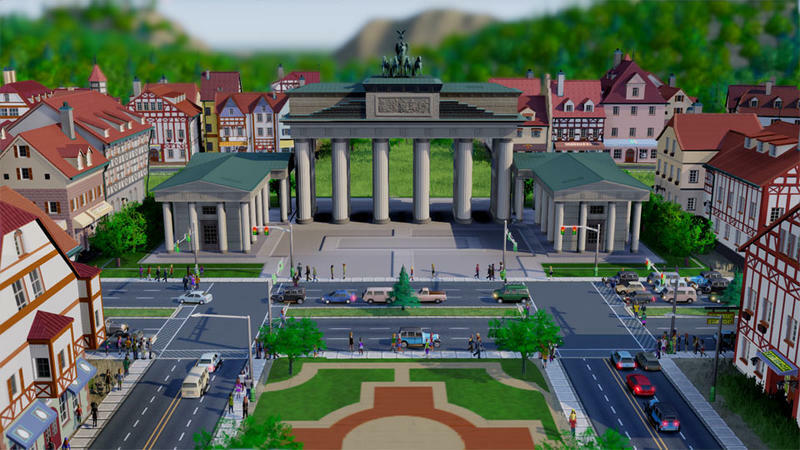 With Region Play, coupled with smaller cities and forced specialties, Maxis makes it so that you actually need other players in order to build that perfect city. It's become impossible to build that perfect city on your own, simply because you must be playing with others. In the 20+ hours that I've logged, I've been resigned to playing with strangers. The problem? I'm having very little success when it comes to actually working with these other mayors towards collective advancement. Here's me, wanting to build an eco friendly city with a tech-focused industry. They build products in a clean, efficient way. However, I need stuff like alloy and plastic to build processors. That means I need to turn to the region or build those extractors on my own. Like we said before, there's not much space in these cities. I tried to build the city I'm describing now. I hit a population wall of around 40,000, and my industry was so far understaffed that it wasn't sufficient enough to run. My point is this: the dependence on others to advance means that building the city you want to build is a virtual impossibility. You need to play with friends, and that's something SimCity fans have never asked for. I'll beat this dead horse one more time before I turn it back to you: make the cities bigger and I'll have more space to support any industry I want. This complaint goes away if that problem is addressed. Eric: I agree that making the cities bigger is going to be key to the game's longevity, and I hope Maxis can do it before it's too late. We're divided on the social mechanics of SimCity, but I know there are some aspects beside the art that we both loved. The first thing that comes to mind is the visual feedback. Joey: Finally, something we can agree on. Eric: This is one of my favorite parts, and also one of the hardest to master. The game throws so much information at the player at any given moment, but it does a great job making it manageable. Joey: I hate to do this, but I'll compare this positive note to Facebook games. Ouch, sorry, but stay with me. Facebook games were designed with easy-to-ingest, visible feedback in mind. Players of all experience thresholds need to immediately understand the problems in front of them and what actions are required to advance. Look at CityVille, for instance. This is a game that keeps every ounce of information at eye level. That makes it exceptionally easy to ingest. SimCity does the same thing. The downside? The tutorial stinks of a Facebook game. It's nothing but arrows telling you where to click in order to advance. The upside? Everything is is extremely straightforward and visual. Water tables, transportation coverage, electricity, ore deposits and city density are all, bam, right there. Eric: I don't think the comparison to Facebook games is bad. They're popular for a reason. The upside is that despite the accessibility of the information, and despite those bugs that keep popping up in our discussion as much as they do in the game, the game doesn't feel dumbed down. Limited, maybe, but not dumbed down. Joey: Right, it's all good stuff. The tutorial feels dumbed down, but the in-game visual feedback is all very smart and snappy. It's intuitive, and it keeps play in the city itself, not on spreadsheets. Eric: I spent very little time in menus and more time turning my city all manner of colors. Eric: We're divided on a few issues. I like what the region play has to offer, and you haven't found that it adds to the game. I like the specialization, while you'd like a bit more room to move. One thing's clear, though: even if a few things have changed, this is still SimCity, and it's still addictive as hell. Joey: I'll agree to that. There are problems here, but they can all be addressed with patches and DLC. 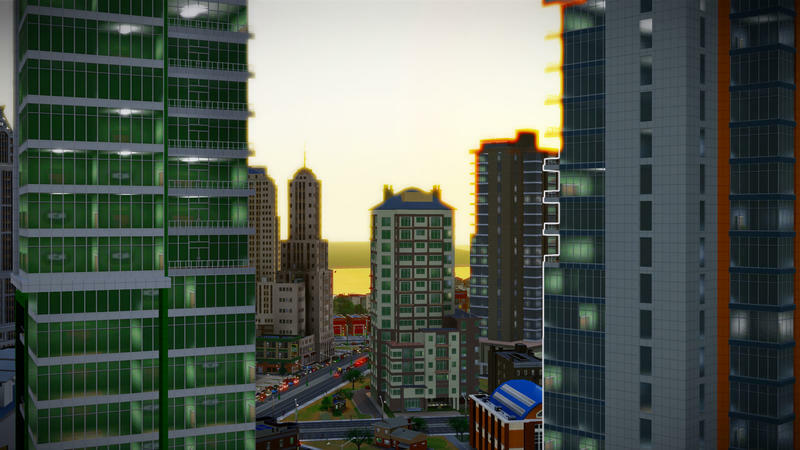 Bigger city size is supposedly in the works at Maxis. We could also see these bugs evaporate in a few weeks. Once that happens, the game gets even better. It's not perfect now, but it's fun. There's so much potential for a long-lasting game, though. Eric: Exactly. 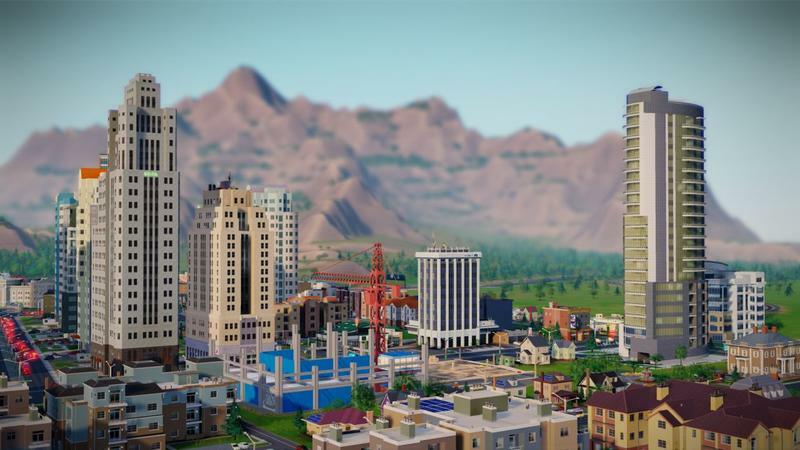 I never would've imagined SimCity would be one of the games that might warrant a later reexamination like we so often see with MMO titles, but if Maxis keeps at it the game's just going to keep getting better. We purchased one copy of SimCity with company funds, and we received another copy from EA that we started playing on launch day. Together, we played more than 35 hours of SimCity before starting this review.